So, what’s the deal with US-spec features? Are they important or not? The short answer is: it depends on what you like. At The FJ Company, our clients get to pick and choose from the various features that Toyota introduced into Land Cruisers over the years irrespective of the market they were intended for. We make those features available in our sales process for you to decide how the truck gets built. 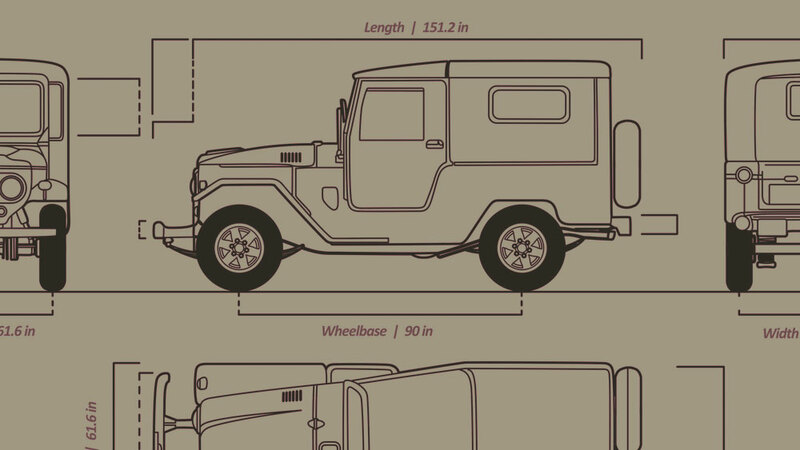 What is a US-spec Land Cruiser? US-spec Land Cruisers are those that were specifically intended by Toyota for US-based customers. In the early days of the Land Cruiser — the 1960s and early 1970s — differences between US spec models and those exported to other countries were less pronounced. Sure, they had right-hand drive vehicles in Australia and in other parts of the world, but everything else was essentially the same. It wasn’t until the arrival of the late 70s that we started to see more pronounced differences. For example, US-spec FJ40s from 1979 and on were equipped to handle higher-speed driving on American freeways. There were also other variations — they had dash pads, a roll bar, and front disk brakes, to name a few. What matters the most is to start with a clean “donor” at the beginning of your restoration. After all, if you want to end up with quality, you have to begin with quality. That’s why we’re so selective with the kind of vehicles we source. We look for restoration candidates that are rust-free in all the right places. Sure, they may look a little rough around the edges, but look more closely and you’ll find good structural integrity and original mechanicals. This is your canvas, and we want it to be in tip-top shape. Whether it originally came with US-spec features doesn’t matter UNLESS you are doing a period-correct restoration (in which case, we will only be restoring what it originally came with). If you are doing a custom restoration, as most of our clients do, we can start with any spec, and add features from any “spec”. At The FJ Company, YOU decide how your Land Cruiser gets built. We do a few basic mods on all of our vehicles, like adding front disc brakes, power steering, a roll bar, and a more modern suspension by Old Man Emu. But beyond that, we’re working with a blank canvas. We’ll build your Land Cruiser from scratch, starting with an authentic chassis produced by Toyota at their factory in Japan. Want US-spec features? No problem, that’s what we’ll do. Don’t care about dash pads? Ok, don’t get them. Prefer driver and passenger window vents common in non-US spec trucks? That’s cool — just visit our online configurator and choose the features you want — or talk to us and let us know what you’re thinking. Here’s the deal: Some aspects of the build process aren’t exactly black and white. For instance, if you do a lot of off-roading in high altitudes, you’ll need a vehicle with a lower axle ratio. And, if you do a lot of highway driving, you’ll want one with a higher axle ratio. Have a specific drivetrain or set of tires in mind? Those needs are factored into the equation as well. But don’t worry, we’ve got this. We’ll come up with some options based on your driving style and how you plan to use your Land Cruiser. Once we’ve got a plan in place, we’ll do what we do best — start building! If you’re interested in a period-correct restoration or a collectible, every single detail matters. Not only should the restoration be period-correct, the intended market of the donor plays a big role in the discussion. If that’s the case, just ask, and we’ll source your Land Cruiser from the market that interests you most. We source vintage Land Cruisers worldwide. Have a question or need more information on specific features? Just contact us. prev postWhat’s the best Toyota engine for my classic Land Cruiser build? next post See you at The SEMA Show! Are you guys planning on having vehicles at the SEMA show in 2017 first week in November? Hope to see you there. Yes, indeed we will, Tom! Check us out at Booth #34309 in the South Hall Upper - waaaaay in the back, but we promise it'll be worth the walk!